Ginger is a root that has a crisp, pleasantly spicy flavor and also boasts many health benefits. In a study published in the Journal of the Science and Food of Agriculture in 2014, researchers found that overweight rats who were given gingerol (a compound found in ginger) were able to lose weight after a 30-day supplementation period. Another study published the prior year in the European Review for Medical and Pharmacological Sciences showed that ginger supplementation had an equal impact on rat weight loss as a popular weight-loss medication, Orlistat. Not only can ginger help with weight maintenance in general, it can also keep that pesky belly fat at bay. 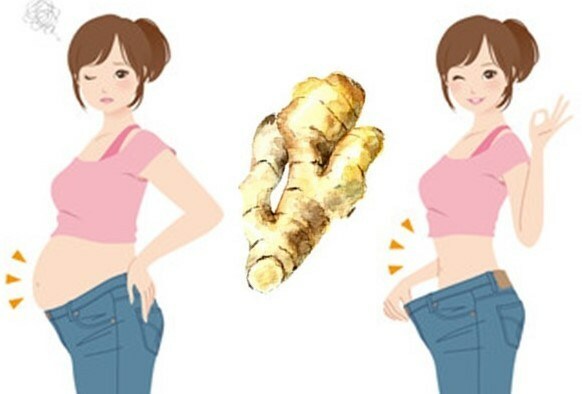 Ginger can target the main reasons that belly fat accumulates, such as overeating, hormonal changes and low energy leading to lack of exercise. Hormonal changes and chronic stress can cause spikes in levels of blood cortisol, which throws the immune system and metabolism out of balance. Consuming ginger can help bring the internal balance back in tune and promote well-being and weight loss. Ginger’s sharp, distinctive flavor can also help naturally boost your energy levels, both physically and mentally. Before eating, chew on a thin slice of ginger root. This will help in regulating metabolism, stimulating digestion, reducing cortisol production and increasing energy. You can also grate a small piece of ginger and add a squeeze of lemon juice and a dash of salt, then mix the ingredients. Eating a couple of small pinches of this mixture before you eat each of your meals helps to control appetite and aid digestion. Don’t limit your ginger intake to before meals—use ginger as a spice in your cooking whenever you can to increase your ginger intake. Cooking ginger for a short period of up to 6 minutes actually enhances its health benefits. Luckily, ginger has a tasty flavor that doesn’t need to be “masked” in order to reap the rewards the plant has to offer. Another great way to get more ginger into your life is by making a delicious and energizing tea from ginger root. Drink this tea two or three times per day to get the most out of it. It’s yummy and not at all hard to make. Put 1 inch of grated fresh ginger root (or 1 tsp. of powdered ginger) into a heat-tolerant glass with a 2-cup capacity. Boil water and pour over the ginger. Allow the grated root to steep in the water for at least 10 minutes. Strain the root from the tea. Add a teaspoon or two of raw honey and a squeeze of lemon juice if desired. Honey and lemon have their own health benefits that can increase the potency of this wonderful tea. Not only does ginger aid in weight loss, it can also reduce inflammation, reduce nausea and quell vomiting, and even kill cancer cells. You can also use ginger to make a special healing drink to detox your body and fight numerous diseases. Dry, powdered ginger can keep for many months when stored in an airtight glass container in a cool, dark place. A fresh ginger root can be kept potent by storing it in the freezer.